Recently I cooked a nice fish dinner for Diana and I. The first course/appetizer was supposed to be some sort of shellfish (oysters maybe) and the main is a lovely halibut recipe from Le Bernardin taken from Eric Ripert’s book On the Line (post about that is coming up soon). However, as soon as I walked past the fish counter at Whole Foods and saw the brilliantly fresh monkfish that they had just gotten in, the oysters went out the window. I had no idea what I would do with the fillet I bought at the time and certainly was not planning on posting about it. When all was said and done and this first course was plated, it looked so nice and was so tasty that I knew it would get its own post. The only other item I had bought with the monkfish is a bunch of watercress. When I got home, I flipped through On The Line since I was already cooking the halibut from it to see if there is anything that would be quick and work for monkfish. Unfortunately the recipe in there, while sounding fantastic, was pretty complicated. I would love to make it some other time with its red wine sauce and truffled potato foam but for an impromptu first course it was not going to happen. I did borrow the cooking technique he uses though. More on that in a minute. 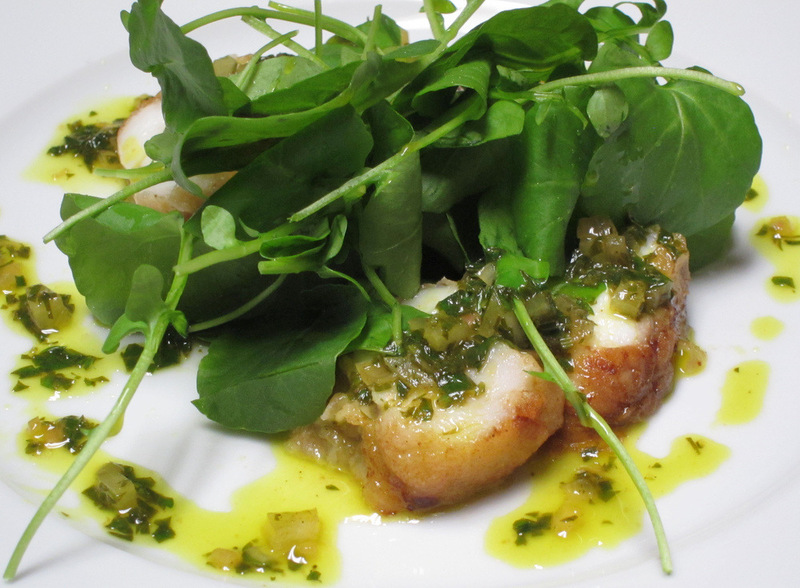 Mario Batali in his The Babbo Cookbook has a recipe for monkfish where he treats it like chicken or veal and makes a piccata. The fish is cut into scaloppine and pan-fried. The dish is finished like a traditional piccata with white wine, lemon and caper berries. 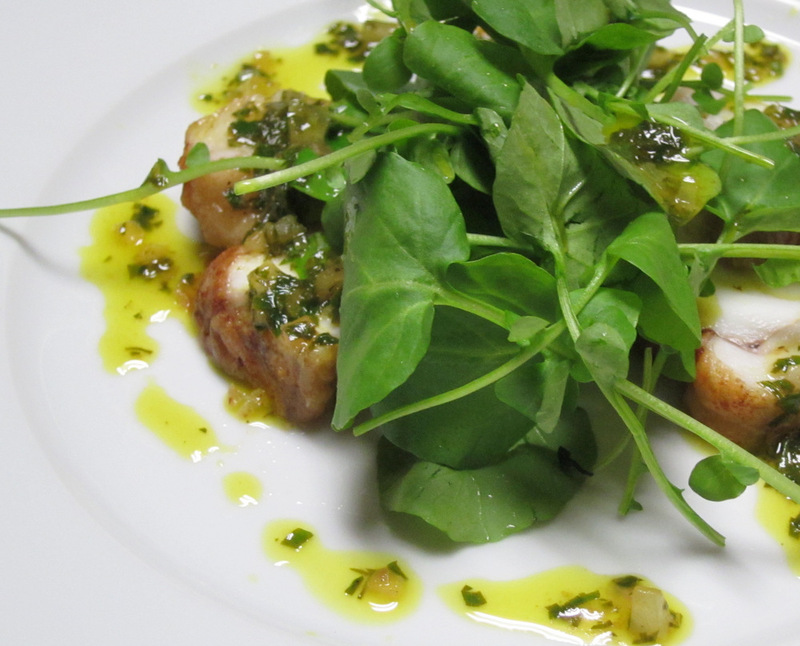 That sounded like a perfect first course for our dinner especially served with a nice bunch of light watercress. Even though the recipe is based on the Batali version, I really liked how the version in Ripert’s book treats the fish – almost like a pork or beef loin. 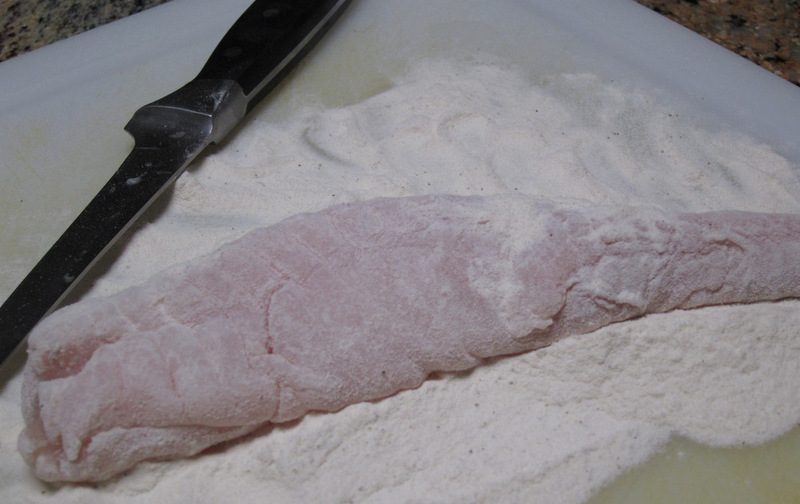 Like no other fish, monkfish can take some longer cooking without drying out. The texture is firm and very pleasant which explains why it is sometimes called “poor man’s lobster”. That’s why Ripert served his with accompaniments normally reserved for red meat (red wine sauce, potatoes, mushrooms,…). 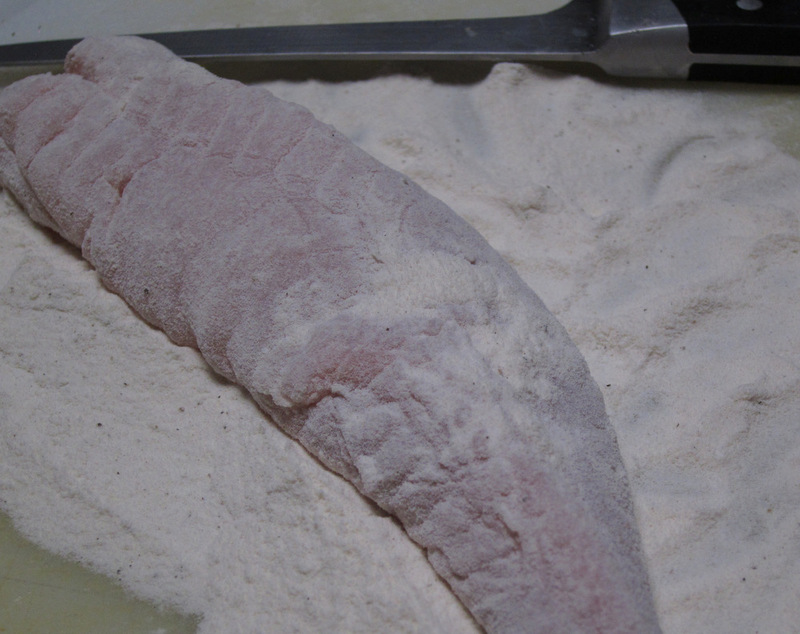 So instead of cutting the fish fillet into medallions I left the “loin” whole and rolled it in lightly seasoned Wondra flour (both Ripert and Batali use that). I love using Wondra to get perfectly crispy thin crusts on all kinds of meat, especially fish. Then I cooked the fish in a pan in some olive oil and butter basting it all the time. After that, just like a small roast, it went into a hot oven to finish cooking through. For the sauce, I deglazed the pan with white wine while the fish rested. Then I added turmeric, parsley, chopped preserved lemon, lemon juice, parsley and a good healthy dose of olive oil. This made for a delicious dressing of sorts. I would’ve liked some caper berries in there or small capers, but Diana hates those. So, no capers. The fish was then sliced into medallions. Any other fish would’ve flaked apart. This was juicy and perfectly firm, really very much like lobster tail. 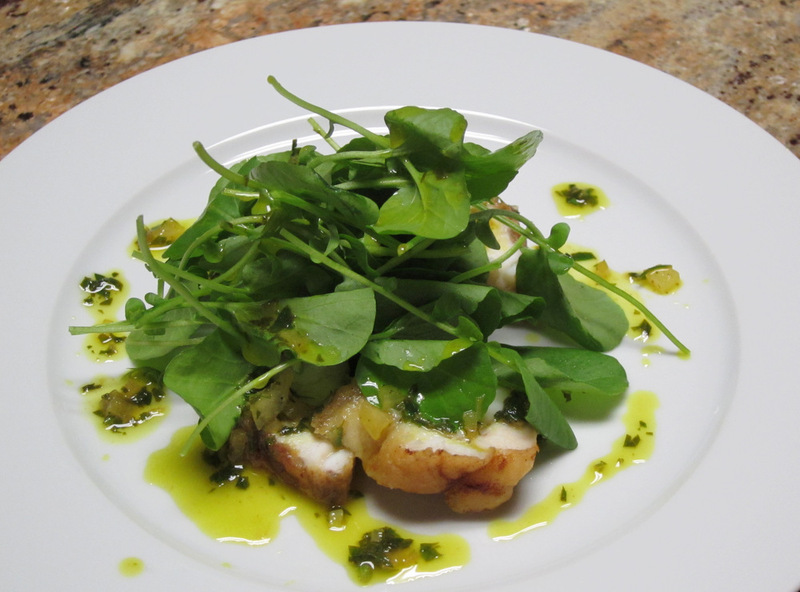 I dressed the cress with some of the pan sauce and put a handful on top of the fanned monkfish medallions. More of the sauce was drizzled on and around the fish to finish it up. I really loved the non-traditional addition of the preserved lemon in the sauce as opposed to just lemon juice. It gave the dish a unique and slightly exotic flavor and some more texture.